Several herbs may be helpful in treating nocturia, which is a condition when you are woken at night by the need to urinate. Nocturia is a common problem among middle-aged and elderly individuals. Before taking herbs to help treat your nocturia, talk with your doctor about possible side effects, proper dosage and potential drug interactions. Witch hazel, also known as Hamamelis virginiana, is an herb that may be helpful in treating your nocturia. A member of the hamamelidaceae family, witch hazel is a shrub that grows throughout the eastern United States and Canada. Witch hazel has an astringent taste and possesses cooling and drying tendencies. The bark of the shrub is used to help treat numerous health complaints, including nocturia. Dr. Sharol Tilgner, a naturopathic physician and author of the book "Herbal Medicine From the Heart of the Earth," states that witch hazel is an anti-inflammatory and astringent, or a substance that causes contraction of tissues. Tilgner notes that witch hazel has a toning effect on your bladder, which may help reduce the number of times you need to urinate each night. You should only take witch hazel supplements after talking to your doctor. Gotu kola is an herbal remedy that may be beneficial in treating your nocturia. Also known as Centella asiatica, gotu kola is an herbaceous perennial plant native to India, China, Indonesia, Australia and Madagascar. Gotu kola is a slender, creeping plant that has a spicy taste and possesses cooling tendencies. The entire plant is used for medicinal purposes. According to Ed Smith, an herbalist and author of the book "Therapeutic Herb Manual," gotu kola has been used to enhance the integrity and vascularization of connective tissue, including the connective tissue that composes the innermost lining of the bladder. 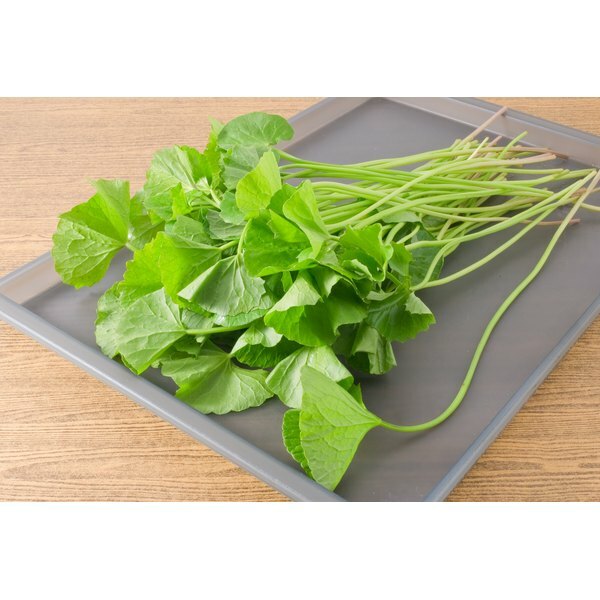 Tilgner notes that gotu kola is helpful in treating incontinence and stimulating the natural growth of supportive bladder tissue. Increased bladder tone may help reduce your nocturia. Consult your doctor before taking gotu kola to discuss proper dosage, possible side effects and potential drug interactions. Saw palmetto, also known as Serenoa repens, is an herb that may be helpful in treating your nocturia. According to the National Center for Complementary and Alternative Medicine, saw palmetto is a small palm tree whose fruit was used for centuries by the Seminole Tribe of Florida for medicinal purposes. Saw palmetto, a member of the palm family, has a sweet taste and drying tendencies. The whole ripe fruit of the plant is used to help treat many health problems, especially problems of your urinary tract. Tilgner states that saw palmetto is a diuretic and antispasmodic that supports tissue nutrition of your urinary tract. Saw palmetto has been used to treat atony, or lack of muscular tone, of the pelvic organs, including the bladder. Increased bladder tone may help reduce your nocturia. Before taking saw palmetto, talk with your physician about appropriate dosage, possible side effects and potential drug interactions.